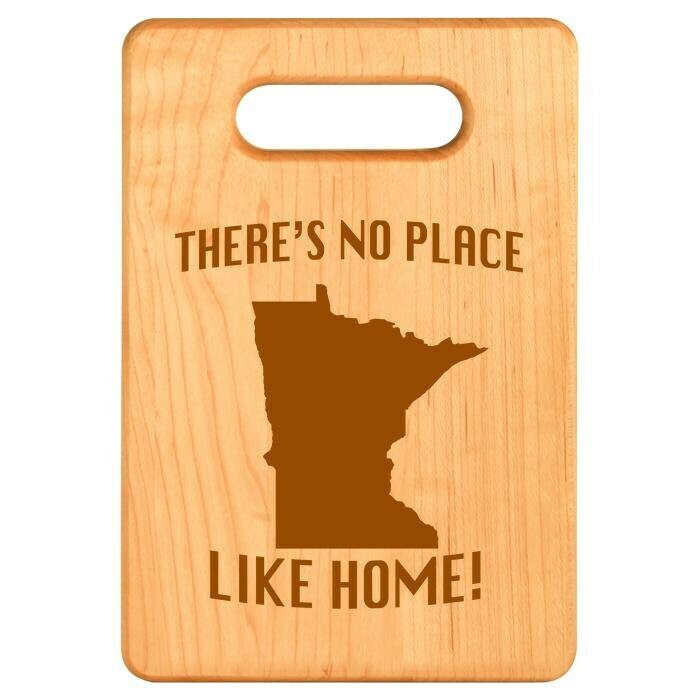 Custom Maple Cutting Board, Minnesota, There’s No Place Like Home! Well done, you have just discovered the perfect custom kitchen gift for all occasions! Our custom maple cutting boards are a great way to get more state pride on display in your home! It features the Minnesota state outline and a reminder that’s “there’s no place like home”. They are perfect state pride gifts for all current and past residents! Not only beautiful, they are also useful and make amazing gifts for cooks of all skill levels from "can't boil water" to "King of the Grill"! These laser engraved gifts are made from real maple wood with custom details added to suit the occasion from an anniversary gift through to Father's or Mother’s Day and beyond! We offer this style of wood chopping board in three sizes to suit your space and/or cooking style (see below). One side is smooth for chopping veggies, meat etc while the other side is personalized with laser engraving and can be displayed when not in use. This custom chopping board is a beautiful keepsake that can be used every day which is why it's the ideal kitchen gift! Order yours now! Wood is a natural product and natural variances and small knots and other imperfections will occur in each piece. • All boards are 3/4” solid Maple. • We recommend hand washing (not safe for a dishwasher). • Thoughtful and useful gift for people who love to cook! Please remember that there may be some slight color variance between the finished product that you receive and the image that is shown on your computer or electronic device screen, We have no control of exactly how your electronic device displays colors or images. Because this product is customized no refunds or exchanges can be issued unless the item is in any way damaged. We pack our products securely to ensure safe delivery but rest assured, if a product does arrive broken or damaged from transit, we will always replace it FREE of charge — (just send us a quick photo of the damaged product). We do NOT include Invoices in any of our packages! Please allow 3 to 7 business days after the date of purchase for your order to process. This does not include standard USPS FREE SHIPPING time, which can take up to 7 days, depending on shipping location. All orders ship from Hannibal, Missouri. 20% discount on all orders over $75 (automatically applied at checkout). 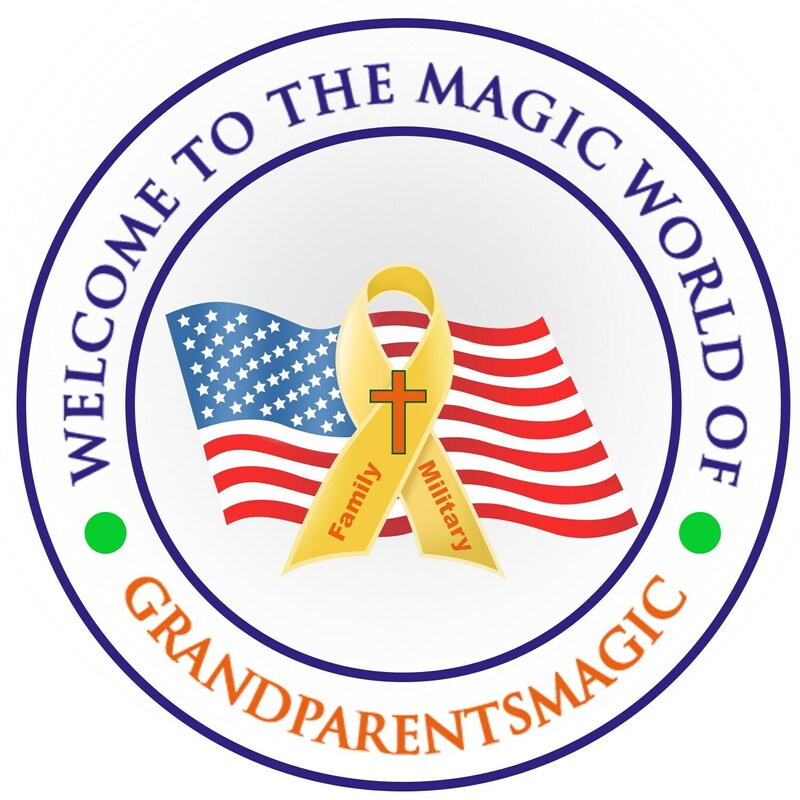 THANK YOU for shopping with GrandParentsMagic! Hang to dry for best results. Take care of your clothing, if you tumble dry on high heat, some items will most likely shrink. OOAK Items, what are they and can I order more than one? OOAK means One Of A Kind Typically, this type of item cannot be reproduced to create another one. Since the handmade process of coloring, dying, aging and even the materials used, we may not be able to replicate. If you saw something in particular you wanted, we can do our best to create another OOAK piece similar in nature, although it won't be completely like the original OOAK item. PLEASE READ OUR SIZING INFORMATION BEFORE PURCHASING. PLEASE DO NOT JUST PICK A SIZE. Our unisex shirts and tanks can be worn by women or men. For women, these items will be a little more loose fitting, and you may want to size down. Please check measurements as they are provided. We only use the highest quality shirts! Please double check all sizing (and spelling if this is a custom order) before placing your order. Feel free to contact us with any questions you may have. There are sizing charts and guides to help with sizing. We will not accept a return because the item doesn't fit. It is the responsibility of the customer to confirm that they are ordering the correct size. Please allow 5-8 business days for the processing and production of your custom item. When your item ships, you will be notified via Etsy, with a tracking number for your item. Unless a customer has chosen to rush or upgrade their shipping, items ship via USPS First Class mail with tracking. Processing times for international sales can take anywhere from 2-4 weeks. We cannot control the time it takes once it leaves our hands. Once the item is stated as "delivered" from the USPS tracking, our duty has been fulfilled. If the package is lost or stolen from your doorstep, we are not responsible. If you are unsure about this and want to purchase insurance, please let us know. Should there be an issue with your order, the customer must contact us within 3 days of receiving their order. Our pictures, text, and designs are original to us and should not be copied, reproduced, transmitted, or re-created without our express written consent. © 2018 GrandParents Magic -- All Rights Reserved. We cannot accept any cancellations on orders after 12 hours of placing your order. We are not able to offer cancellations on express orders after 4 hours of placing your order, as these orders are processed immediately. If a customer requests a cancellation after the 4-hour mark of an express order, if the order has not already shipped, there will be a 25% restocking fee on the total order amount, not including shipping. We accept EXCHANGES if the Merchandise is Defective. Exchanges must be made within 3 days of the delivery date. We ask that you send the product back and the exchange will be issued after we receive the defective product(s). Email picture of the defective product first. We can print any phrase or saying you request as long as it’s not offensive. We love creating custom items! Any design can be printed on a wide variety of shirts and sizes - Contact us if you don't see the size or style you're looking for. We love what we do and will continue to do our very best to put out great items! Check out ALL of our Social Media sites! The perfect gift for your favorite person or the perfect pick-me-up for yourself! All of our Baby, Toddler, Youth, Ladies Classic and/or Adult T-Shirts, Hoodies, Bodysuits, Leggings, Coffee Mugs, Travel Mugs, Water Bottles, Tote Bags, Wine Bags, Can Wraps, Aprons, Pillows, 1, 3 or 5 Panel Canvas Wall Art are PRINTED ON DEMAND with the latest direct to item technology. We use laser engraving technology for Wine-Beer-Other Glassware and Cutting Boards. Shirts are printed on ONE side only AS SEEN in photos. PLEASE BE AWARE the color on your screen and the color in person on the shirt may vary slightly. No decorative accessories pictured are included, only the shirt!